This Korean hybrid of Snakes on a Plane and World War Z probably shouldn’t work anywhere near as well as it does. Events take place more or less over the course of a single day, as workaholic single father Seok-woo (Gong) takes his young daughter, Soo-an (Kim) on the 200-mile journey from Seoul to Busan, where her mother/his ex-wife now lives. Unfortunately, this trip coincides with the outbreak of a lethal, fast-spreading epidemic. 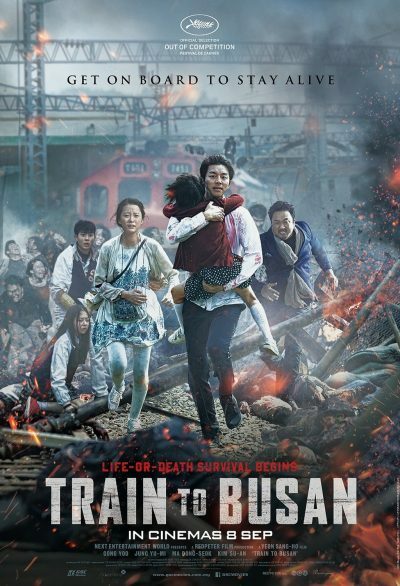 While he’s initially unaware of the situation, a ‘Patient Zero’ boards the train, and it’s not long before Seok-woo and the rest of the passengers are fending off deadly carriages full of 28 Days Later-style infected victims. On its own, that has the potential to be good – though as the amazingly-named but woefully awful zombies-on-a-plane flick, Flight of the Living Dead showed, it’s all in the execution. However, just as that idea seems to run out of steam (hey, railway puns – we got ’em! ), the train is stopped short of its intended destination. Unfortunately, the station into which it pulls is not the desired safe-haven, resulting in the WWZ section, with waterfalls of zombies falling onto the platforms from the concourse. It also breathes new life into the film, as our hero and his daughter, along with a dwindling band of genre stereotypes, attempt to get out of the city before becoming dinner. It’s the kind of film which you probably could pick apart without much effort. For instance, some of the digital effects are distinctly ropey, and the story-line will be familiar to anyone with even a passing knowledge of the genre. Yet, it’s still greatly entertaining, mostly thanks to Yeon’s imaginative eye for carnage, on both the small- and large-scale. The enthusiasm and inventiveness present goes a long way to overcoming the limitations in the script, although I imagine some of the apparent social commentary will fly over the heads of a foreign audience. The pace, too, is quick: the film gets out of the blocks fast, with the supremely creepy resurrection of a zombie deer, and proceedings continue to gallop, rather than shamble, toward the camera at a brisk rate thereafter. This has some interesting twists on zombie lore, such as their inability to figure out doors, or the visual cues they require. If the undead can see you, they are immediately driven into frenzied attack-mode, but if they can’t, they calm down, which put me in mind of Shaun’s mom’s line from Shaun of the Dead: “We shut the curtains.” Naturally, this only offers a brief respite, and it’s soon back to the mayhem, with the creatures here contorting and spasming their bodies in near-epileptic fashion, acting as a force multiplier to their overall creepiness. Like the monsters themselves, just when the genre seems to have gone to meet its maker (we’re debating even giving up on The Walking Dead), something like this comes along, bringing it back from the grave once more. There’s life after death yet, it appears.